The key to understanding Earth's evolution, including how our atmosphere gained oxygen and how volcanoes and earthquakes form is too look deep, really deep, into the lower mantle some 400 to 1,800 miles (660 to 2,900 kilometers) below the surface. Researchers , led by Alexander Goncharov (Geophysical Laboratory) and including Carnegie Summer Scholar Ben Haugen (University of Colorado) and new CDAC partner Steven Jacobsen (Northwestern), mimicked conditions of these depths and recently discovered that the concentration of highly oxidized iron (Fe3+) in the two major mantle minerals-silicate perovskite and ferropericlase-is key to moving radiative heat in that region, and that influences material movement throughout the planet. They also discovered that less oxidized iron (Fe2+) has much less effect than expected - 2 to 5 times lower than previous models suggested. 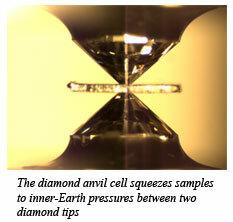 The results, which are reported Nature, call into question current models of mantle dynamics. The team developed a new optical spectroscopy system to reveal how matter absorbs heat from infrared through ultraviolet wavelengths; in addition they measured how energy is dissipated. They subjected the minerals to mantle pressures-up to 1.3 million atmospheres at room temperature and subjected ferropericlase to 590,000 atmospheres at temperatures up to 1160°F. The scientists found that heat absorption is governed by the concentration of ferric (Fe3+) iron in silicate perovskite and ferropericlase. They also noted changes in absorption related to spin-state transition, but the effects were smaller than previously believed. Spin transition occurs when electrons are bunched closely together under severe pressures and the spinning electrons are forced to pair up from unpaired electrons-a high-spin state-to paired electrons-a low-spin state. Their results for silicate perovskite in the visible and near infrared for radiative heat absorption showed that it is dominated by the charge transfer of electrons during oxidation-when electrons are lost-in the oxide O-Fe3+[Goncharov, et al., Nature, 456, 231-234 (2008)].